To develop cationic lipid-coated magnesium phosphate nanoparticles (LPP) for intracellular catalase (CAT) delivery. 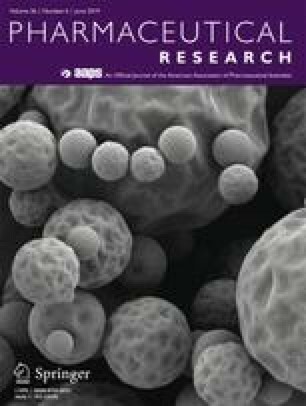 Magnesium phosphate nanoparticles (MgP NP) were prepared by micro-emulsion precipitation and mixed with catalase-loaded cationic liposomes (DOTAP/cholesterol) to yield LPP formulation of catalase (LPP-CAT). The size and ζ-potential of LPP-CAT were measured by dynamic light scattering. The pH-sensitivity of LPP-CAT was determined by monitoring their degradation of hydrogen peroxide (H2O2) and their morphologies under transmission electron microscopy (TEM) at pH 7.4 and 5.5. The ability of LPP-CAT to protect MCF-7 cells against hydrogen peroxide was measured by MTS assay. ROS levels in EA.hy926 cells were measured after treatment with LPP-CAT. LPP-CAT were successfully prepared and carried an average diameter of <300 nm and ζ -potential of about +40 mV. At pH 5.5, LPP-CAT degraded H2O2 almost 4-fold as fast as pH 7.4 and displayed drastic morphological changes of an osmotic explosion. LPP-CAT protected MCF-7 cells from lethal level of exogenous H2O2 and significantly lowered the ROS levels in EA.hy926 cells. A lipid with a pH-sensitive conformational switch (flipid) further enhanced the protein delivery of LPP-CAT. LPP represents a promising nano-system for intracellular protein delivery. Yunzhou Fang and Mallika Vadlamudi contributed equally to this work. This work was supported by National Institute of Health (GM107823). We thank the technical consultations from Professor Leaf Huang and associates at University of North Carolina, Chapel Hill. We thank Electron Imaging Facility at University of California, Davis for access to TEM. We thank Professor Xiaoling Li at University of the Pacific for access to UV spectrometer for kinetic analyses of catalase activities.